Takashimizu brings together only the finest local ingredients. We also carry out contract farming to secure good quality rice. Akita is blessed with superb quality rice and is described as a “Rice country with excellent sake”. Various kinds of sake rice are cultivated and the developments of new breeds in cooperation with industry and government are also active. Recently, “Akita-sake-komachi” which bears comparison with the king of sake rice “Yamada-nishiki” was developed and has been supplied not only in Akita but also all of Japan. 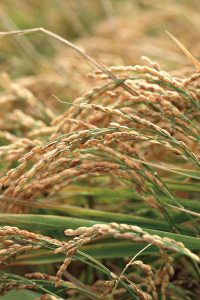 Rice used in Takashimizu is almost produced in Akita except for “Yamada-nishiki” from Hyogo Prefecture. In addition, we carry out a contract farming with dedicated farmers in Yuzawa-city and Akita-city to secure good quality sake rice stably. We have had meetings thoroughly based on the results of quality inspections in previous year, and aimed for quality improvement of rice. We aim for further quality improvement with introduction of fully automatic polishing device. One of the biggest factors of decision for sake quality is polishing. Ideally, polishing, which is needed uniform finish, should be performed until we can be convinced its finish in our own factory. 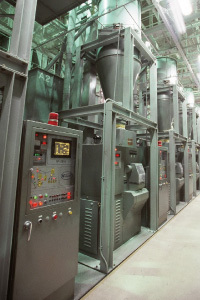 In 1990, we built one of the leading rice polishing factories in eastern Japan for brewing, which holds latest technology. This makes it possible not only to achieve uniform polishing but also high-ratio polishing such as rice polishing ratio of 35%. We always pursue high quality sake brewing. Sake rice used in Takashimizu. 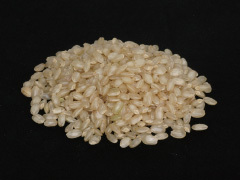 Sake rice has larger grain than table rice and Shinpaku (center part with opaque white color). It has aptitudes for sake brewing. It bears comparison with Yamada-nishiki and has large grain and Shinpaku. This breed is suitable for the climate of Akita and makes it possible to secure the fixed quantity stably. 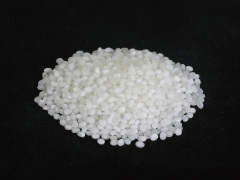 It has less protein which makes unfavorable sake taste, and its starch is easily dissolved. Therefore, sake brewed with Akita sake komachi has refined taste and flavor, and also light aftertaste. It is said that this is one of the greatest sake rice for its well-balanced components, size of Sinpaku and rice softness. Takashimizu uses selected Yamada-nishiki from Hyogo Prefecture, where the best place for Yamada-nishiki cultivation. Developed in agricultural laboratory in Nagano Prefecture in 1978. It is named after its Shinpaku like snow which covers the top of mountain. Akita is the second rank of cultivated area after Nagano.